Last year I had an amazing time in Greece, spending 3 gorgeous days in Athens. Here I want to show you my favourite restaurants in Athens, that kind that you definitely can’t miss! Awesome traditional Greek Food, with great portion sizes and fair prices. 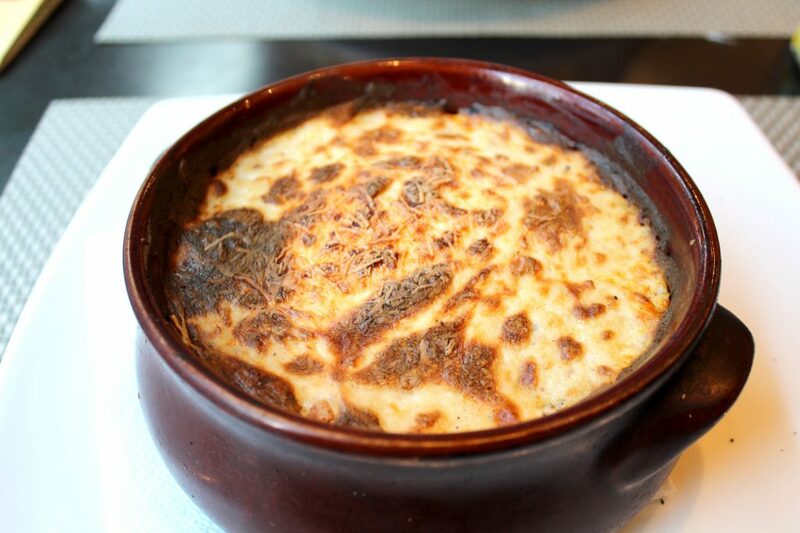 Mousaka – Layer of eggplant, layer of potato, minced beef, cream, and cheese. Outstanding views from The Acropolis followed by great food. 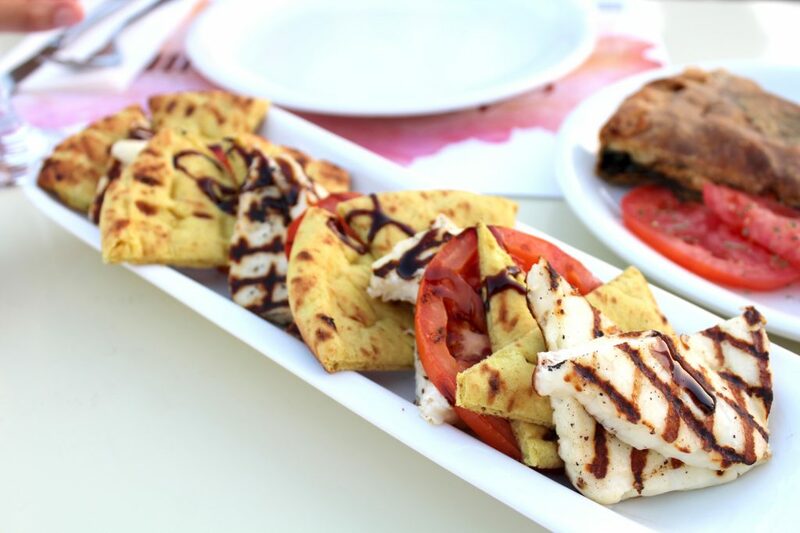 Grilled Haloumi, baked tomatoes, and pita bread in a balsamic dressing. Great Greek food and awesome service. 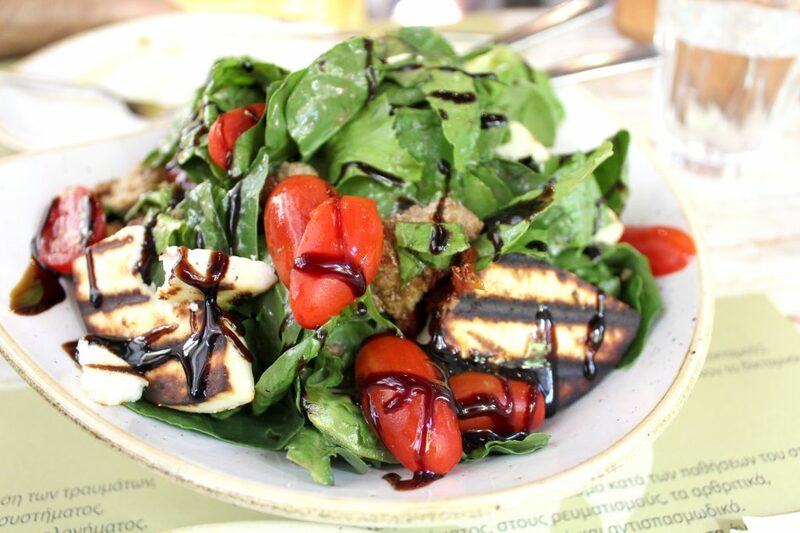 Green salad – with manouri cheese, sun-dried tomato, rockets, lettuce, and balsamic dressing. 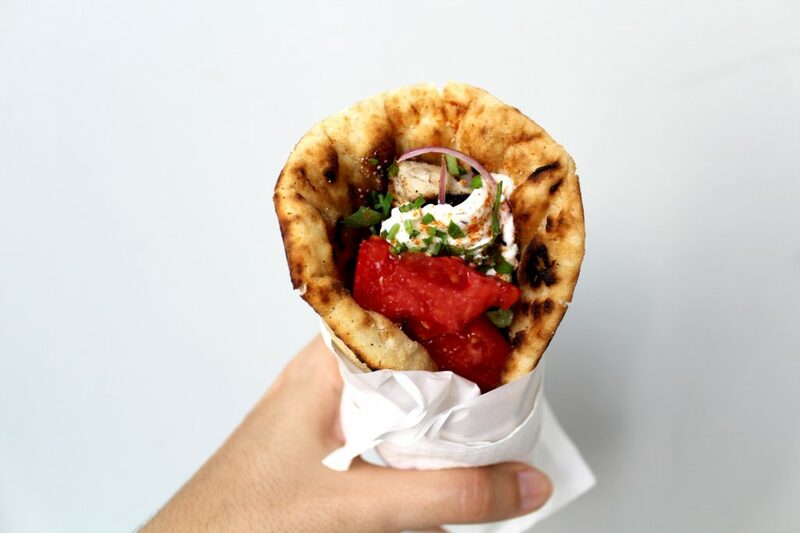 Best gyros and kebabs in Athens! Pork and beef with tomato, parsley, onion, feta, and tzatziki sauce. 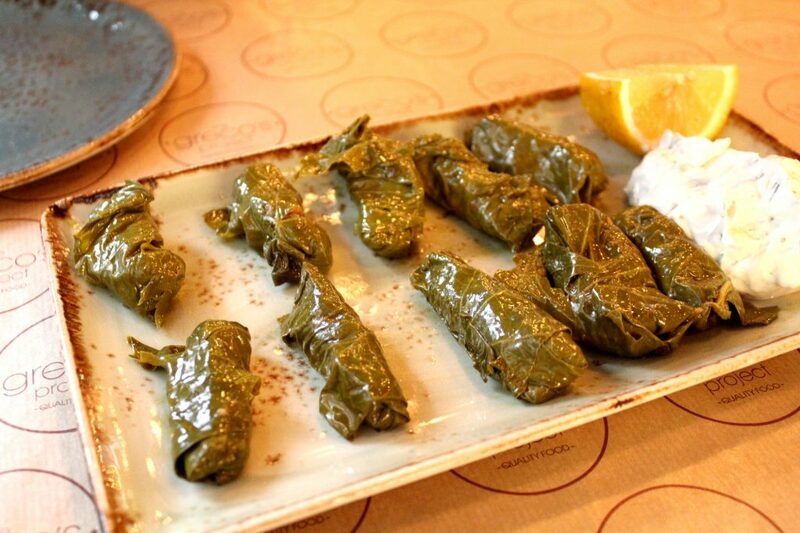 Huge variety of Greek foods served in a modern and great atmosphere. 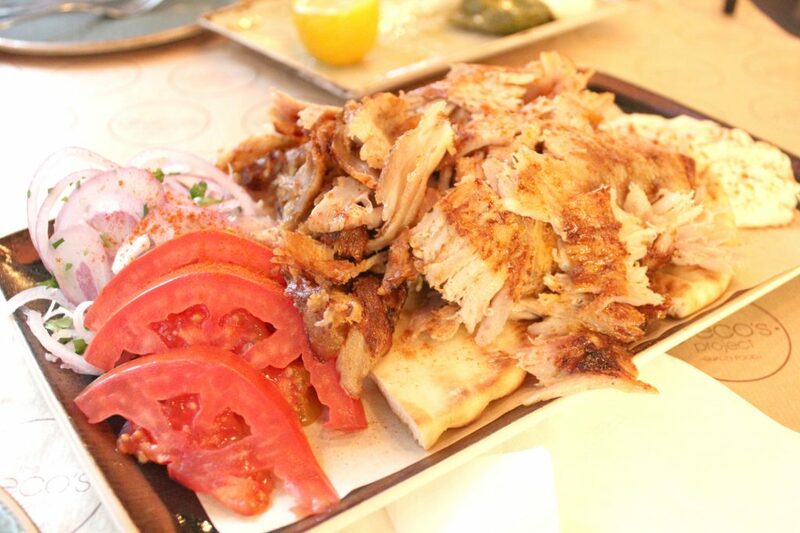 Pork Gyro platter – served with tzatziki sauce, tomato, onion, sweet paprika, and pita bread. Greek Yogurt bar for you to refresh an delight yourself. 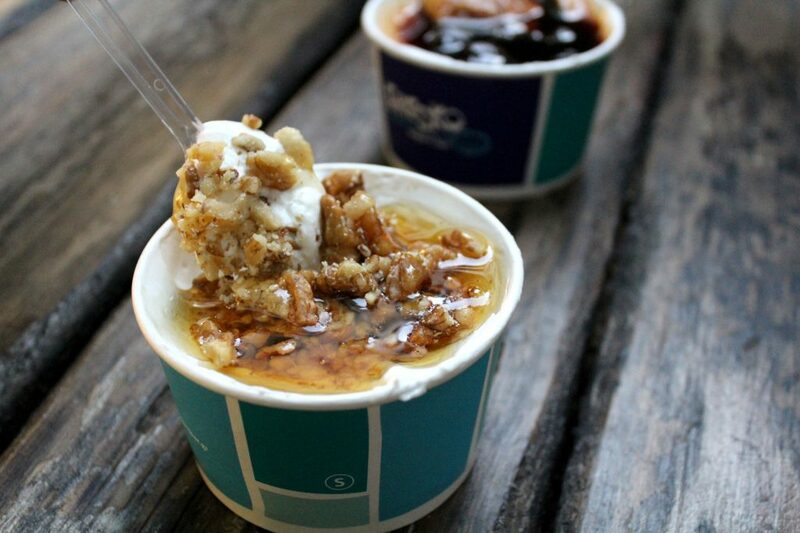 Greek yogurt with honey and walnuts. 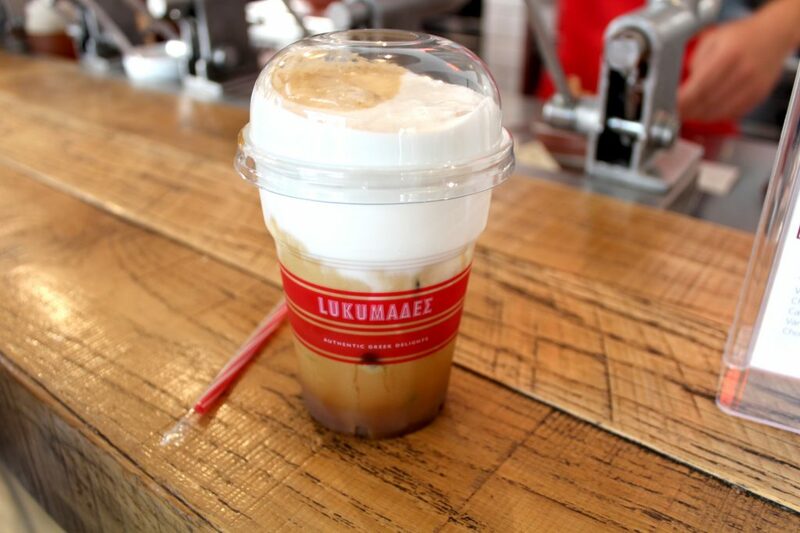 Traditional Greek yogurt, coffee and of course desserts. Greek yogurt with nuts and honey. Greek style doughnuts and yummy desserts. Double chocolate cookies – praline brioche ice cream, white chocolate, chocolate praline, and oreo cookies. 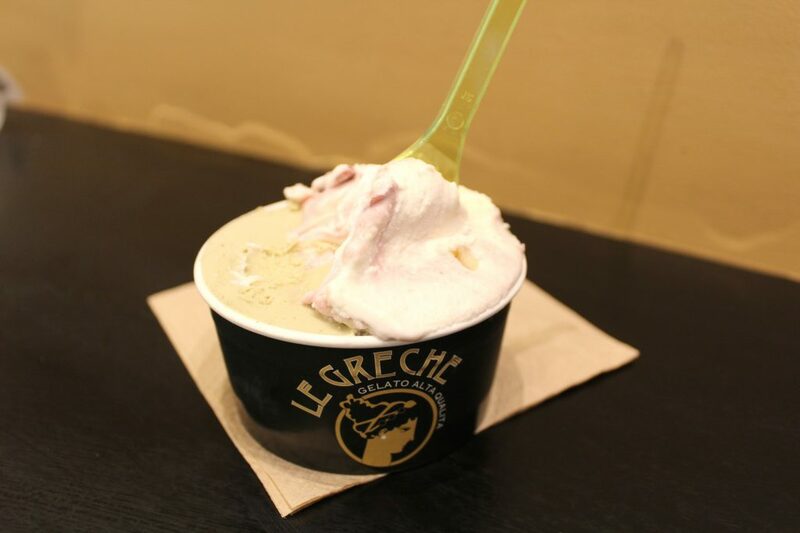 Good quality Italian gelato in the heart of Athens. Cookies and Cream, and Coffee. 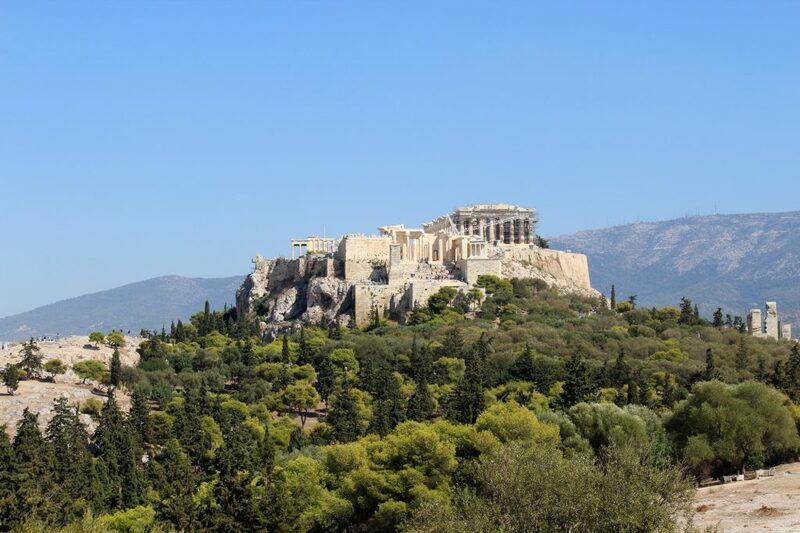 3 days in Athens – attractions. Athens was one of my favorite destinations last year when I was spending my holidays in Europe. I loved the city, the historical and super famous landmarks, and of course the Greek people! Everyone is super friendly, kind and they do know how to offer a good customer service! It was impressive how well served we were at every place we visited, not even counting the free dessert many restaurants give to you with your bill. Such a great way to finish an amazing meal, right?! I had 3 amazing days there, which I’ll be happily sharing with you now. Start your tour in Athens by visiting the famous Greek site The Acropolis, which is actually a mountain home of a collection of various historical spots, such as the Parthenon, Theatre of Dionysus, Odeon of Herodes Atticus, Erechtheion, and Areopagus Hill (Mars Hill). 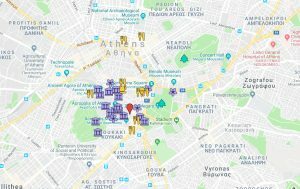 You need to buy tickets to access this site, which also gives you access to other touristic buildings and areas around The Acropolis and I’ll be showing bellow you on the following days. Le Greche was a wonderful surprise. We passed in front of it after a long day out sightseeing under 38C degrees. The busy shop and of course, the idea of having gelato caught our attention straight away. The shop offers many gelato flavors and there is also some beautiful desserts available, the kind that makes you wish you had more space in your belly to fit everything you see. Hubby: Cookies and Cream, and Coffee. Super good quality gelato! We had been to Italy a few days before, and this place was totally up to the excellent quality gelato we had there. The shop also says their gelato has no emulsifiers, artificial aromas or colorings, margarine, and artificial additives. Good place for a refreshing Italian gelato or some yum dessert. Prices and portion sizes are also super competitive. The Greco’s Project – entrance. 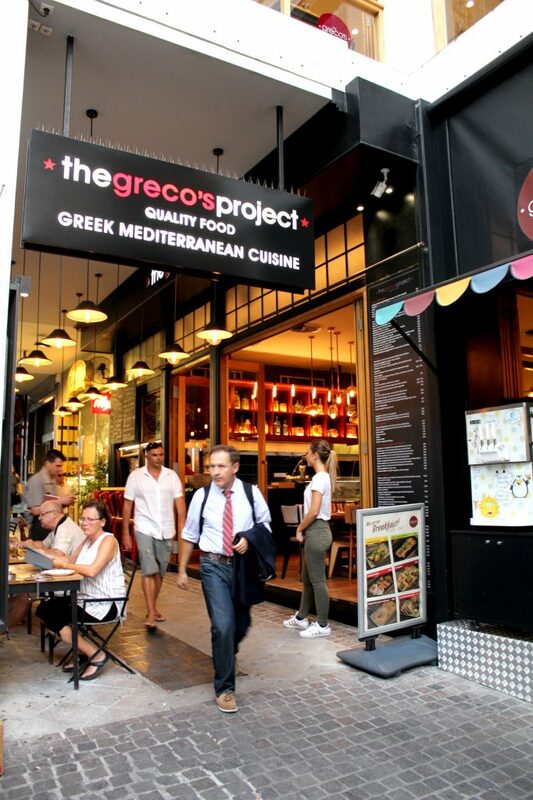 At The Greco’s Project, you can find tons of super delicious traditional Greek food, served in a very cool and modern place. The restaurant is indeed super beautiful inside and on their menu, you will see this huge variety of Greek dishes, from street food to those dishes that only a Greek mama could make. 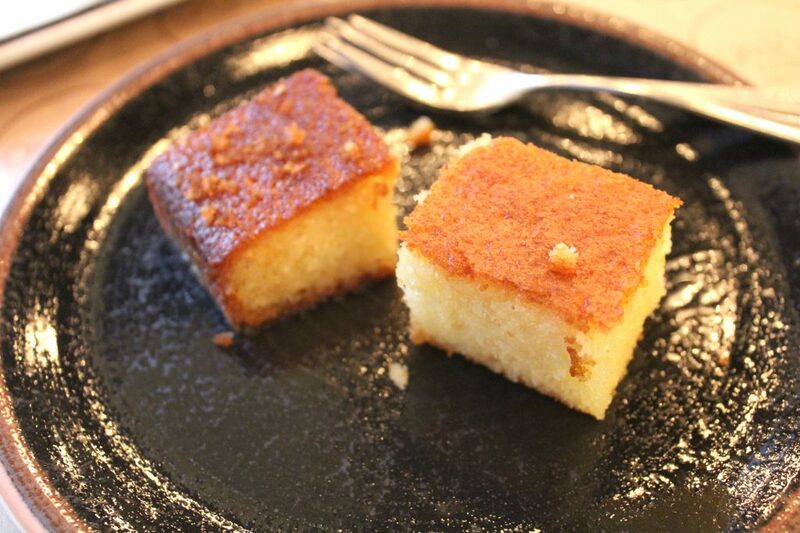 On the house, semolina cake. 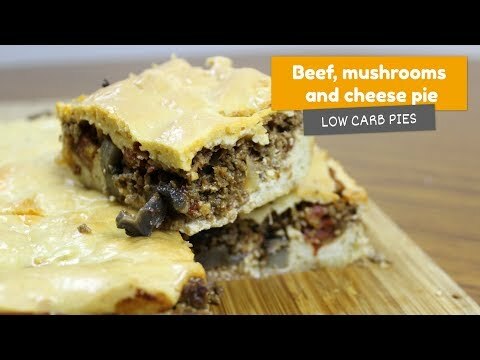 The ratio, portion size and price is excellent, with the plus of you having a super tasty meal. Can’t complain about our main, that Pork Gyro Platter served very well my husband and me, and it was yum! A positive point for the free semolina cake served with our bill. This one had a hint of orange that was a fantastic surprise! I really like this cozy and super friendly thing Greeks have, let’s pray together for more countries that give customers free dessert! Good place for lunch, dinner, or even a drink late in the evening. The atmosphere is awesome and the place offers a very good service. 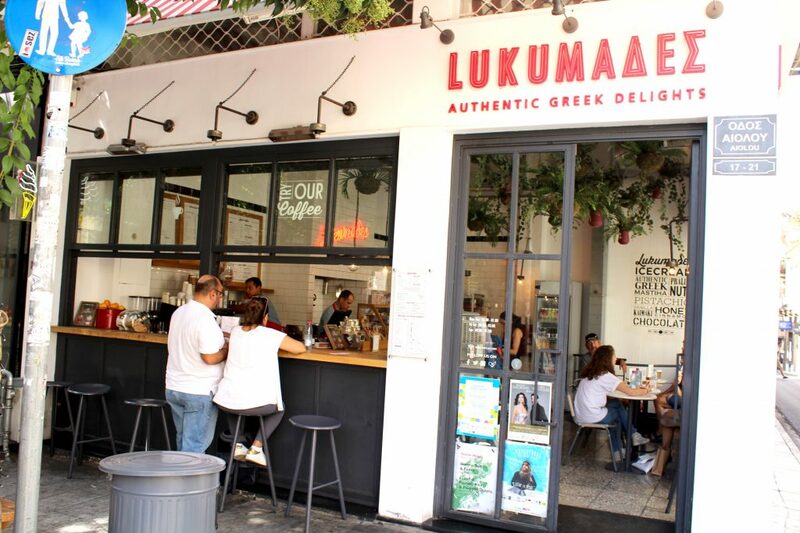 Lukumades is a traditional Greek doughnut and also the name of this café easily found in Athens. 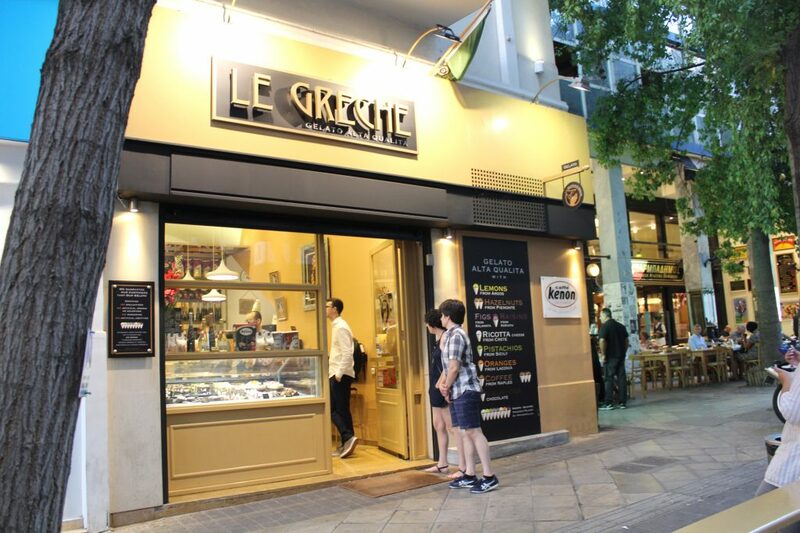 There you can find the famous treat and also ice creams, different types of coffee and other goodies to make your day sweeter while in Athens. 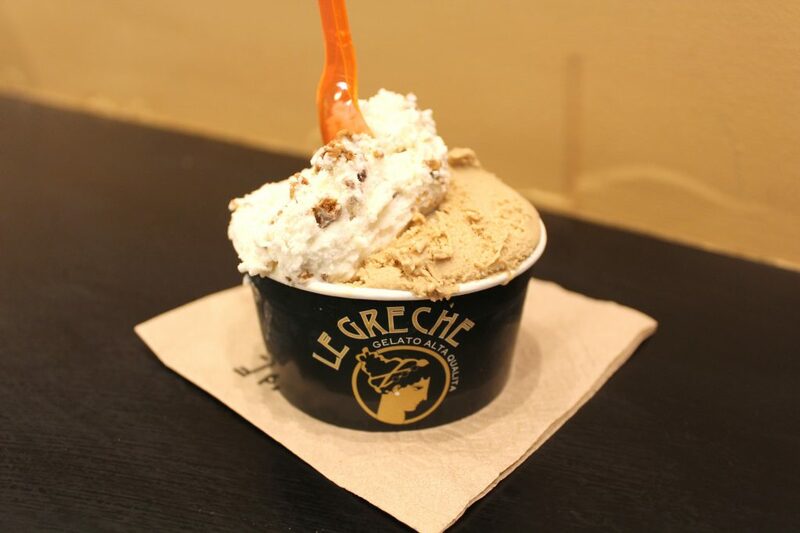 Double chocolate cookies – praline brioche ice cream, white chocolate, chocolate praline and oreo cookies. Cappuccino Freddo was good but had nothing special. It was a refreshing drink under those 40C degrees that day, though. 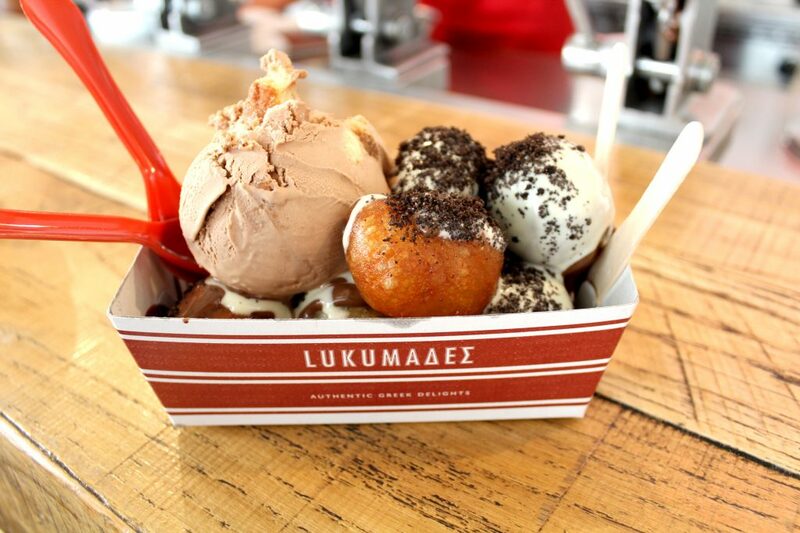 Turning to the lukumades, they are basically doughnuts coated in sugar syrup. In this case, the one we bought had ice cream, oreo cookies, and some chocolate sauce. It was indeed good but extremely sweet, so go for it only if you have a sweet tooth, for us it was too much and we left behind like 80% of it. Good place for a break and to have a nice coffee.